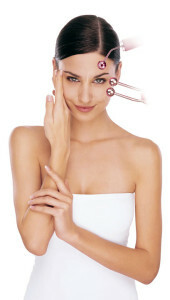 “Facelift without a Facelift” Treatment. Hydrodermie muscle tightening is an exclusive Guinot lifting treatment that includes massage to stimulate the muscles and brings oxygen to the skin by circulating the blood flow to the epidermis layer. It’s almost like a gentle bodybuilding session that, recognizing the skin as a living organ, was created to help it live and age better. This unique treatment features the use of galvanic currents, nourishing gels and message to stimulate the skin and firm the face by exercising the muscles deep down. Cellular activity is reactivated and facial features are lifted to spectacular effect. You can actually feel your muscles pulling up! Our clients tell us that they feel little twinges in the areas being lifted. By the end of the first muscle tightening session you will see the difference. 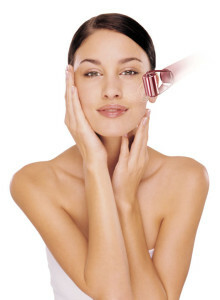 Your face looks smoother and firmer, and visibly younger with no injections. We call it the Guinot glow. Our skincare therapists utilize ionization – a mild electrotherapy along with gentle massage movements using special rollers to help the plant-based actives deeply penetrate the skin, deep cleansing the skin and revealing a more youthful appearance. Oxygenation is a high frequency technique used to oxygenate and energize the cells at a very deep level, as well as create an anti-bacterial effect. A customized mask and relaxing lifting massage help relieve muscles and boost the skin to a refreshed state. Muscles that are exercised will regain their tone, while the mask helps reduce the puffiness of excess fluid and toxins trapped in the skin. Hydrodermie Muscle Tightening (outlined above) – allow 1¼ hours. Hydrodermie Muscle Tightening with Hydra Plus – allow 1½ hours. The ultimate treatment that begins and ends with a specific serenity massage. Targets the eye and neck areas with firming and hydrating gels to smooth away the signs of aging and restore a healthy glow. Hydrodermie muscle tightening treatment recommendations for best results: one treatment per week for four to six weeks, then one per month thereafter to maintain the lifted effect.